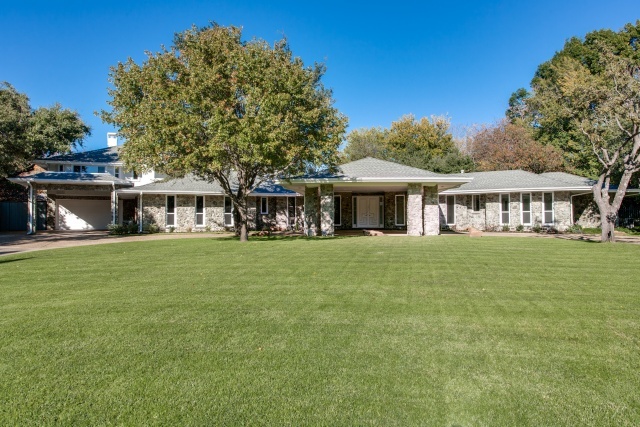 Situated in Russwood Acres on a gorgeous 0.682’-acre lot with breathtaking grounds and mature trees, a circular drive and two porte cocheres, this stunning, completely remodeled ranch masterpiece, with a stone exterior, is perfect for entertaining. Bright and open with floor-to-ceiling windows providing an abundance of light, most of the rooms overlook spectacular views of the scenic pool and landscaped grounds. Details include spacious entertaining rooms, gleaming hand-scraped hardwood floors, textured walls, deep molding, Lutron lighting, Sonos Sound System with speakers, and gorgeous marble, granite, travertine and silestone finishes throughout. The approximately 6,525-square foot, two-story home offers four bedrooms, 4.1 baths, six entertaining areas, two dining areas, four fireplaces, a wet bar, covered veranda, pool and a two-car garage. Sophisticated and sleek, enter through oversized double wood doors to a dramatic entrance hall, which gleans with illuminated decorative and rope molding, gleaming hand-scraped hardwood floors and a coat closet. Providing great entertaining flow, the entry opens to the study and to formal living room, both where handsome hardwoods continue. The spacious study is framed by a wall of built-ins with bookcases and a Silestone-topped floating desk area. Light-filled floor-to-ceiling windows also yield natural light on the hardwoods. The entry also flows through a trio of arched entries with columns to an expansive formal living room, which is capped by a 12-foot barrel-vaulted beamed ceiling and is centered by a brick fireplace, with a raised hearth and chimney breast wall. Floor-to-ceiling windows provide an abundance of light and a door also opens to the covered veranda and pool area. The space also steps up to an adjacent formal room, which is graced by a trio of fabulous crystal deco chandeliers and floor-to ceiling windows overlooking the veranda. The dining room also flows to the professional chef’s island kitchen, which showcases a pop-up ceiling, granite counters, premier stainless appliances, including a pair of Gaggenau cooktops (gas and electric), Viking Ventahoods and Thermador warming drawers, Thermador dishwasher and double convection ovens, SubZero refrigerator with freezer and a Manitowoc ice maker, a stainless steel farm sink, and a large breakfast area, including granite-topped built-ins with glass front top cabinets. A door also opens to the pool area. The nearby oversized great room is crowned by a pop-up vaulted ceiling and framed by a stone wood-burning fireplace, with a raised hearth and chimney breast wall, and also features light-filled windows. A door also opens to the side porte cochere. Perfect for entertaining guests, the expansive game room boasts two areas. The first is appointed with a two-story ceiling with a stunning crystal deco falling chandelier and is served by a granite-trimmed wet bar, which houses a stainless steel bar sink and a Manitowoc ice maker, abundant wine racks and a bar serving area. A staircase also leads upstairs to the second level and an open upstairs den looks down to the first floor. Double doors also open to reveal a two-car garage, and a closet provides storage. The second area flows through a trio of arched entries to an oversized living area, which is centered by a fireplace, with a white marble surround and a wood-carved mantle. Both areas feature floor-to-ceiling windows overlooking scenic views of the pool area. To the right of the living room is also a fabulous sun room, which is capped by an illuminated pop-up, octagon-shaped ceiling with a skylight and floor-to-ceiling windows overlook the landscaped backyard and pool. The luxurious downstairs master suite is spacious and showcases neutral carpeting and light-filled floor-to-ceiling windows. The gorgeous white marble bath with mosaic glass tile detailing is graced with an expansive floating vanity with His and Hers sinks, a claw foot tub, separate shower with glass tile and His and Hers huge walk-in closets. An adjacent room with a white marble-topped floating make-up counter adds elegance to this gorgeous setting. There are two additional generous-sized bedrooms on the first floor, both with neutral carpeting, floor-to-ceiling windows, large walk-in closets and are served by a fabulous Jack-and-Jill bath with a floating Silestone counter and slate flooring. A fully equipped utility room houses a mud nook, abundant built-ins with Silestone counters and a sink area, slate floors and also provides room for a full-size washer and dryer. An elegant granite powder room and slate pool bath round out the first floor. For added convenience, a Launchpad is equipped with iPad technology to allow you to select your choice of Sonos Sounds as well as Lutron lighting throughout the home. Second level of living is equally impressive. Crowned by a tray ceiling, an additional luxurious master suite is oversized and is accented with bay windows, elegant molding, neutral carpeting, and a see-through fireplace to the master bath, which features a travertine surround with a raised hearth and a wood-carved mantle, and is flanked by a built-in bookcase. Spa-like, the fabulous marble and travertine bath is replete with an expansive floating vanity with His and Hers sinks, an additional floating vanity desk, separate double steam shower and His and Hers entries to a huge walk-in closet. An upstairs den is spacious and boasts a flat screen television flanked by built-ins with bookcases, floor-to-ceiling windows and neutral carpeting. Outside, the fabulous backyard grounds and pool is an entertaining utopia! The covered veranda features flagstone decking, a ceiling fan, and also overlooks incredible views of the shimmering pool and spa, stone detailing, an expansive sunbathing deck and verdant landscaped backyard grounds with mature trees. All set the tone for a sophisticated atmosphere for entertaining. A two-car garage with abundant storage space completes this fabulous residence. Additional amenities include a stone, brick and iron fence, ceiling fans, abundant storage space and a sprinkler and security system.